The first dish Chef Pablo "Boy" Logro offers is the awesome Seared Tuna Salad with Mango Vinaigrette. The combo of flavors that explodes in the mouth as one sinks his teeth into this fab grub is enough reason to go Nippongo this summer. 1. Place all ingredients in a blender until smooth. Set aside. 2. Season tuna with salt and pepper. Pan sear and set aside before slicing. 3. 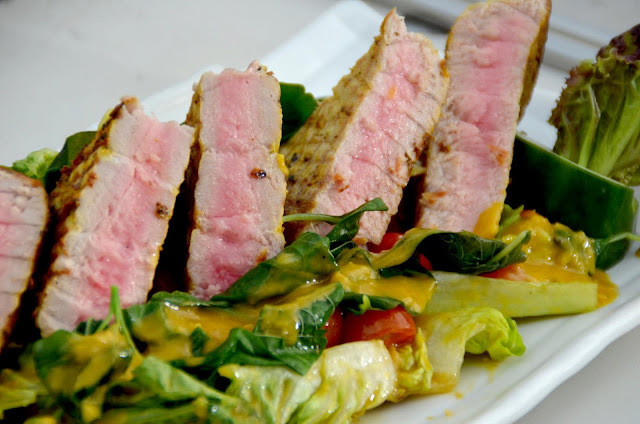 Assemble lettuce, spinach and sliced tomatoes, plate the tuna and drizzle with mango vinaigrette.